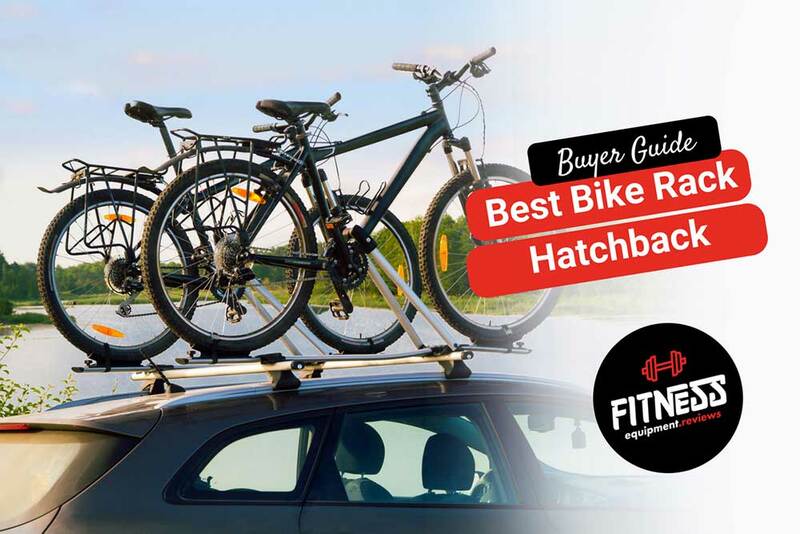 The Top 8 Best Bike Racks for Hatchbacks Reviewed for 2019! A bike is an important asset for most of us, especially when we travel. It allows for some nice sightseeing and can also help you save money you’d waste on hiring a cab to travel. Plus, it’s adventurous as well. However, carrying a bike can often be a trouble. There might not be enough space at the back of your car to slide your bike in and close the trunk. It requires dismantling the bike and folding it to accommodate in the space. A simple solution to the problem is to get the best bike rack for hatchback. They are bike carriers which are installed to the back side of your car and add to the space.. Roof racks – installed on the roof. Hitch bike racks – installed to the hitch of the car. Trunk bike racks – installed on the truck of the car. We have shortlisted some of the best bike racks for cars on the basis of features and price. Let’s go into the details. The Swagman hitch bike rack is big enough to accommodate two bikes. It’s very secure and makes sure your bike remains still even if the ride is bumpy. Secures bikes from 3 spots. Easy to load and unload thanks to the upright arm with ratcheting hooks. Arms can be folded down to get easy access into the back. Perfect for bikes up to 3-1/2″ wide wheels. The shank is 4 inch elevated to provide sufficient distance between the rack and the road so that the bike doesn’t hit the ground. The rack can easily bear a total weight of 70 pounds. You can carry two bikes of 35 pounds each without any hassle. It fits 1-1/4 by 1-¼ or 2 by 2 inch receiver which pretty much covers all the cars. There is a no wobble bolt system to ensure that there’s no wobbling between the hitch and the rack. The soft cushion on the grip arms protect the bikes from damage. Rear window can be opened while there’s a bike on the outer rack. No rattling and no wobbling. Quite heavy – 40 pounds. Doesn’t come with a lock. If you’re looking for a hatchback that’s secure then Swagman XC can be a good pick. 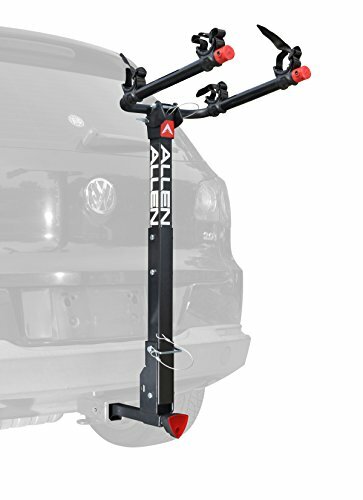 The Allen Sports Deluxe is one of the best hitch bike racks that you’ll find on the market. It aces in almost every depart including ease of use, durability, security, and price. Tilt the rack backwards when not in use. No movement in the racks due to no wobble bolts. Doesn’t scratch the car’s body. Can carry 4 bikes together. 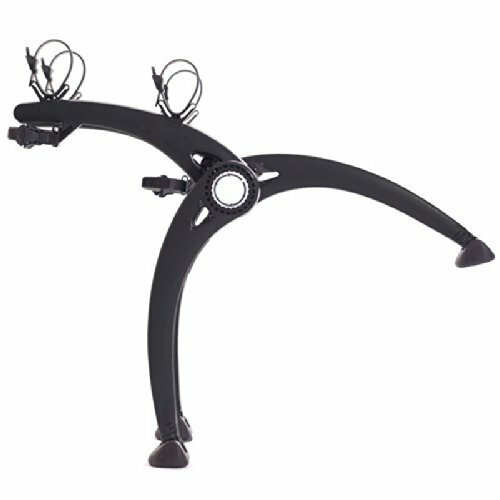 The bike rack offers amazing security thanks to the 22” carry arm that secures each bike separately. Since there are no wobble bolts installed on the bike rack, there is no movement in the racks. Hence, no risk of scratching and damaging the car’s paint. When the rack is not in use, the carry arm can be folded away and the rack can be tilted backwards to access lift gate without having to remove the bike rack. The patented tie-down system further lets you secure your bikes and restrict movement in the rack. The quick install locking hitch locks the rack to provide more security. Fits on a 2 inch or 1 ¼” hitch perfectly. Removing the rack requires a lot of effort. The rack is quite heavy – 20 pounds. If you’re group of friends or a large family of people who love to take their bikes along when travelling then the Allen Sports Deluxe is the right bike rack for you. It’s durable and affordable as well. 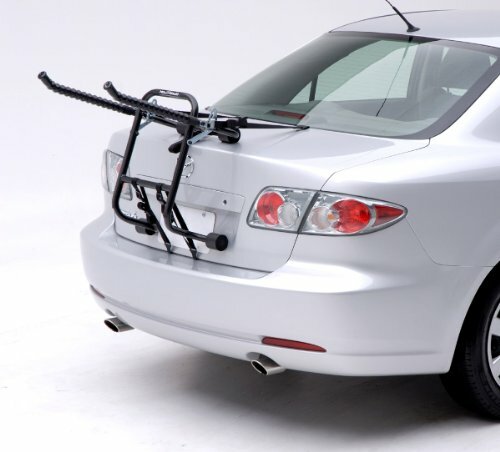 If you don’t like the idea of attaching a bike rack to the hinge of your car then a trunk bike rack is what you need. Thule Passage Trunk mount carrier can be a good option. It offers amazing durability and also keeps the bikes secured when being transported. You can opt for either a 2 bike carrier or a 3 bike carrier. They’re similar in terms of security but differ in prices. Soft rubber cradles to protect the bike. Accommodates a wide range of different bikes. Prevents contact between the bikes transported. Six straps for added security. The design of this trunk rack is not only stylish but convenient as well. You can fold down the rack arms when not in use to make room and access the trunk. The hatch and the trunk receive no damage or scratches because of the soft cushioning leg paddings on the rack. With a patented fitdial feature this lets you fit a wide range of bikes regardless of their frame types. It offers top notch security by offering a six strapped security system by which you can hold down your bikes. Thanks to this, the bikes stay very still. Bike clearance – anti sway avoids contact between the bikes. Can bear around 10 pounds per bike. No sway cages restrict frame movement. Vinyl coated buckles prevents scratches. Lock strap needs to be bought separately if the bike has a non-conventional frame. The Thule Passage Trunk mount carrier will cater to your bike transporting needs like a pro by offering good security, easy loading, and longevity. The Saris Bones is one of the most versatile racks you’ll see on the market. It supports almost all the cars with rear spoilers. You can either opt for a 2 bike or a 3 bike version. A 2 bike rack can bear 35 pounds per bike, making it suitable for a total weight of 70 pounds. Arc based design looks beautiful. Anti sway straps for security. Lightweight and easy to install (9 pounds). This rack will transport two bikes easily without damaging each other. The injection-molded arms and legs are there to provide amazing stability and restrict movement in the rack. The bikes are locked securely thanks to the hold down straps. The dual level setup provided by the rack makes sure that the bikes do not clash with one another. Doesn’t scratch the car’s surface. Saris Bones can be a good choice if you need a lightweight hatchback that can support two to three bikes. If you’re not good with assembling units then opt for Hollywood Racks F1B as it comes pre assembled. Tie down straps for extra security. Fits any car truck thanks to the multiposition hinges. 14.5 inches distance between the support arms. Multiposition hinges are easy to fit and adjust to the car’s trunk without any trouble.This is as sturdy as it comes and is often claimed to be indestructible by the manufacturer. The rack is designed to carry 3 bikes at max and you don’t have to worry about the bikes colliding with each other and getting damaged because there’s a 14.5 inches space between each of them. There’s a tie down system which lets you attach straps on the bike to make sure they don’t move or get loose. Can be folded for storage purpose. Lightweight – weighs only 13 pounds. Designed to last long and also comes with a lifetime warranty. Security straps are made of average rubber quality. Tech support from this company is not up to the mark. 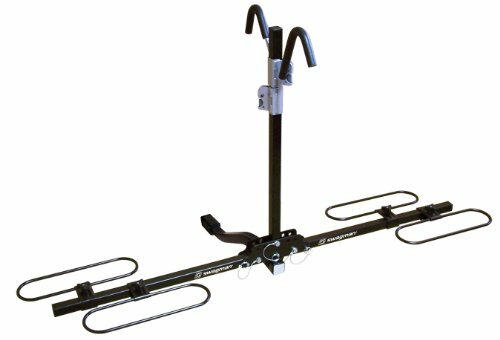 If you are looking for an affordable trunk bike rack then the Hollywood Racks F1B is your best bet. The lifetime warranty it comes with should be enough to keep you satisfied. Fits 20-29" wheel and fat bikes with up to 5" tires and hub spacing up to 142mm. 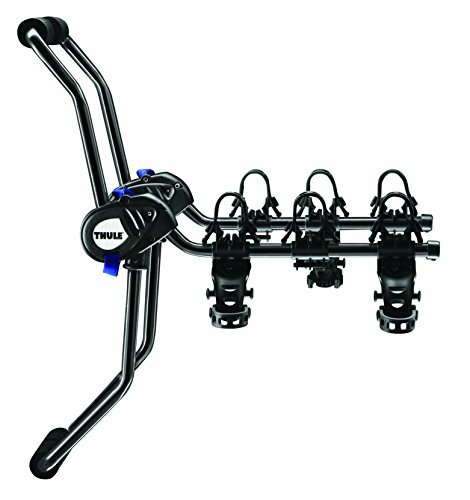 The Thule T2 Pro bike rack is special because it can accommodate not just bikes with thin tires but with thick tires as well (up to 5 inches). You won’t have to make any alterations to the bike or the rack, it supports a wide variety of bikes with different frames. Fold rack in 3 different positions (down, up, and folded). Locking knob restricts the hitch or rack from moving. Cable lock system for added security. 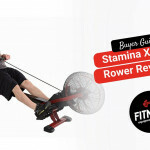 It is hassle free to assemble and install because the two important parts, support arm and pivot, comes pre-assembled. So, you only need to assemble the wheel trays and you are good to go. The rack can be folded when not in use, put in a horizontal position when carrying bikes and in a downward position when you want to move it away from the trunk access. Once the pin is in lock, there is no movement. Fits a wide range of bike types. Can bear 70 pounds in total. Ratcheting arms to secure the bikes. Cable lock for added security. The cables that come with the unit are not so strong. If you find installing a rack a difficult process then this product is right for you as it doesn’t require any tools. 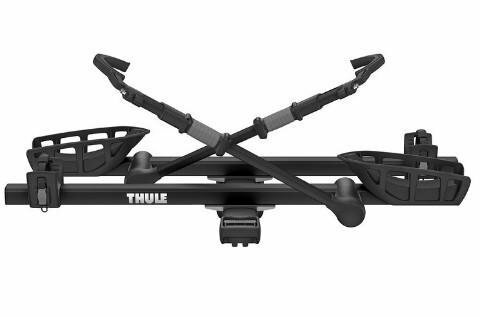 You only have to assemble the wheel trays to make the Thule T2 Pro bike rack operational. 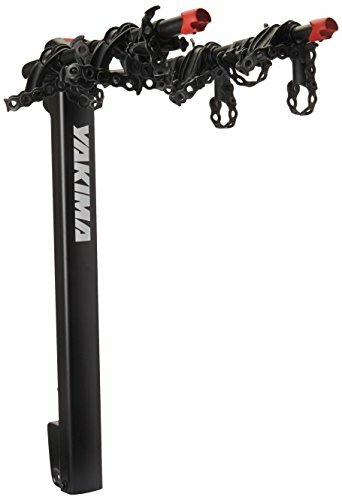 Carrying four bikes is not a problem for the Yakima rack thanks to its durability and design. Its arms can swing all the way down and give access to the trunk area. Moreover, the arms are padded to prevent the bike from damage due to rubbing. Lock system to avoid bike stealing. Swings all the way down, offering access to the trunk area. Ratchet style straps keep the bikes secured. This bike rack can bear 150 pounds of weight in total. Hence, carrying four bikes is not a problem for it. The arms that hold the bikes are padded which is why you won’t find a single scratch on the bikes. There’s an integrated bike lock system that prevents your bikes from getting stolen. Anti sway cradle avoids bike contact. Tilts when not in use. If you are looking for an affordable bike rack that can carry serious weight and multiple bikes then the Yakima rack is the right choice. 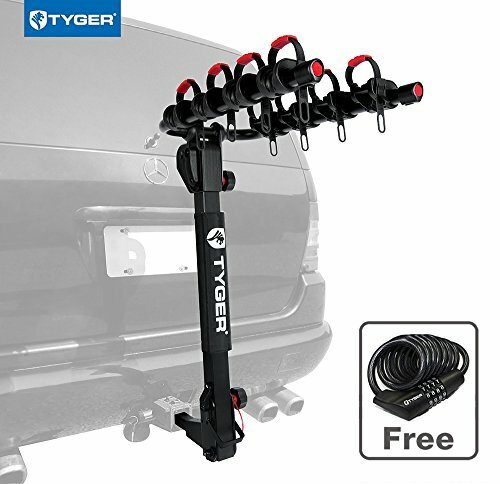 The Tyger rack can accommodate all dual armed bikes with 1.25 or 2 inch hitch receiver. This beauty can carry 4 bikes without any trouble. Bar cushions and soft cradles protect the bikes from scratching. With the safety strap and bike lock, your bikes are safe and can’t be stolen. There’s an e-coating on the body of the rack which makes it immune to rust. So expect this beauty to work for a longer period of time. Doesn’t fit on Toyota Tacoma. You don’t get to buy such heavy duty racks in such low price. The Tyger rack has a limited lifetime warranty and can carry up to 4 bikes. You need to pick a bike rack as per your requirement. If you are willing to carry 1 or 2 bikes then there’s no need to spend extra and buy a bike rack for 4. However, if you have a large family and you love to take frequent trips then getting a 4-bike carrier rack is a wise choice. Also, make sure to enquire about the types of bike frames it can accommodate and the wheel sizes as well. Lastly, the rack should be able to bear the total weight of the number of bikes you want to move. If you have no issues in accommodating the bikes on a trunk or a hitch rack then go for it. However, if you own a SUV and there’s extra space on the top of your vehicle then you can also get rooftop racks. At the end of the day, it depends upon what you’re comfortable with. A bike rack doesn’t have to be a complex tool that you find hard to handle. It should be easy. Make sure that the rack has foldable features so that you can tilt it when you want to access the trunk. In case of hitch racks, there should be no wobbling because a wobbling rack squeaks a lot and can also cause damage to the bikes. A mechanic can drain your pockets if you ask him to install a bike rack to your car’s trunk or hitch. Therefore, getting a rack that you can install on your own can be a good choice. Do Racks Damage The Car And Bikes? It depends on which one you buy. A bike rack that is rust proof and has soft cradles and protective padding on the arms won’t damage the bike even if you are carrying multiple bikes together. As for damaging the car, a few precautions will keep your vehicle safe. These include locking the bikes tightly so that they do not move and scratch against the vehicle. Hence, go for bike racks that offer good distance between the bikes and the vehicle. In case there are straps, make sure they are tight or else loosely held bikes will scratch against the car’s body and cause scratches. At the end of the day, choose a bike rack for hatchback that’s best for you. Consider the number of bikes you want to move and the weight they have in total. When you do, enquire if the rack will be able to bear the weight or not. Other than this, consider security, ease of use, durability, and ease of installation as well. Contrary to popular belief a hatchback can accommodate bikes! These products are all highly rated so have a read through and make your decision.